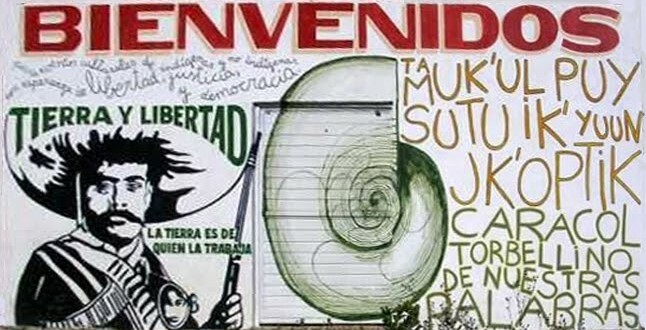 “Today, as 20 years ago, the counterinsurgency strategy against the Zapatista indigenous peoples continues: military forces, paramilitaries, ‘democratic campesino organizations,’ commercial media, ‘social programs,’ and the whole political class are part of this war of extermination, a war which is headed by the bad governments, both federal and state, who only serve the interests of a system which needs dispossession, exploitation, neglect and repression in order to survive,” says the Network for Solidarity and against Repression. These events came to light on January 31, when the Zapatista Good Government Junta, Heart of the Rainbow of Hope, from Caracol IV, and Whirlwind of our Words (based in Morelia, Chiapas) denounced new aggressions suffered by Zapatista support bases (BAZ). The attacks were made on the iconic Zapatista community of 10 de Abril in the autonomous rebel municipality 17 de Noviembre, by groups of government supporters belonging to the group Independent Center of Agricultural and Campesino Workers (CIOAC) Democratic, from the nearby Tojolabal community of 20 de Noviembre. Six BAZ members were injured, three of them seriously, and one is in danger of losing his sight. Furthermore, a shocking attack also took place on staff from the San Carlos Hospital in Altimirano who came to give assistance, but were attacked and prevented from attending to the injured. One of the most remarkable achievements of the Zapatistas following the historic uprising of January 1, 1994, one which transformed the lives of tens of thousands of indigenous people, was the reclamation, or recuperation, of huge areas of land and territory. As in many cases prior to 1994, the BAZ of what is now the ejido (communal landholding) of 10 de Abril worked their ancestral lands, taken from them after the Spanish conquest, as paeons or servants of the landowners who used the lands for cattle ranching, and treated their workers with abuse and contempt. Following the uprising, the serfs descended from the rocky hillsides to the fertile valley and reclaimed their heritage. In March 1995 they set up the community of 10 de Abril (named in honor of Emiliano Zapata, assassinated on April 10, 1919,) and worked their own land again in community as free men and women. They now use their land to grow crops including coffee, corn, beans, vegetables and bananas, and have declared the rest, which is forest and mountain and rich in unusual species, to be an ecological reserve. “When we saw our compañeros fall we sought emergency help from the San Carlos hospital, in Altamirano…. but the CIOAC Democratic aggressors did not let them through because they were blocking the crossroads.” The ambulance, along with the driver, a doctor and a nun, “were taken hostage by them to their ejido.” Once at 20 de Noviembre, the three hospital personnel were beaten. Two other nuns were following the ambulance in a pickup truck. Sister Patricia Moysén Márquez relates how they were stopped by a large number of people carrying sticks and machetes, who threatened to burn the vehicle, and pulled the nuns out. She refused to give them the keys. She describes how women from the same group “started to defile us, trying to take the keys away from me. As I resisted, they began to undress us. They put their hands wherever they wanted and held both of our arms. They hurt us, tore my jacket and took out the keys and my purse where I have all my documents. I asked them to return it to me but they flatly refused.” The aggressors took the vehicle, and the nuns managed to escape. The other staff were released later that night. One of the main tactics of counterinsurgency is funding, training, arming and promoting the development of “shock” groups of local indigenous, lured by the promise of land, guns, money, status and material possessions, who are ordered to attack, threaten, harass, provoke, undermine and ultimately destroy the BAZ communities. Disguised as social and agricultural organizations (such as CIOAC and ORCAO,) or in some cases as evangelical churches (like the Army of God) some are fully paramilitary, while others are less well-armed. These groups are made up of supporters of the government and the political parties, and actively promote the government “social” and “welfare” programs, which are used as another means of undermining the resistance. In response to the attacks, pronouncements have been made from countries including Italy, Germany, Spain, the UK, France and the US as well as from groups in various parts of Mexico. One group from France relates in their pronouncement how some of their members were students of the Escuelita, the Little School of Freedom according to the Zapatistas, in the community of 10 de Abril, already emblematic following the long-term presence of an Irish group of human rights observers and accompaniers from 1997 to 2000. The French group describe how carefully the community cared for the trees in their now-ravaged ecological reserve.